Are You Using a Lazy Stop-Loss? Unlike other static or lazy stop-loss tools, the Dynamic Trailing Stop (DTS) uses proprietary “Smart-Stop” technology to protect your profits while minimizing risk. When price consolidates or moves sideways, the DTS clearly identifies support and resistance levels — remaining unchanged until price exits consolidation and resumes moving upwards or downwards. Though there are many stop-loss indicators, the DTS consistently outperforms other methods with superior accuracy and flexibility. 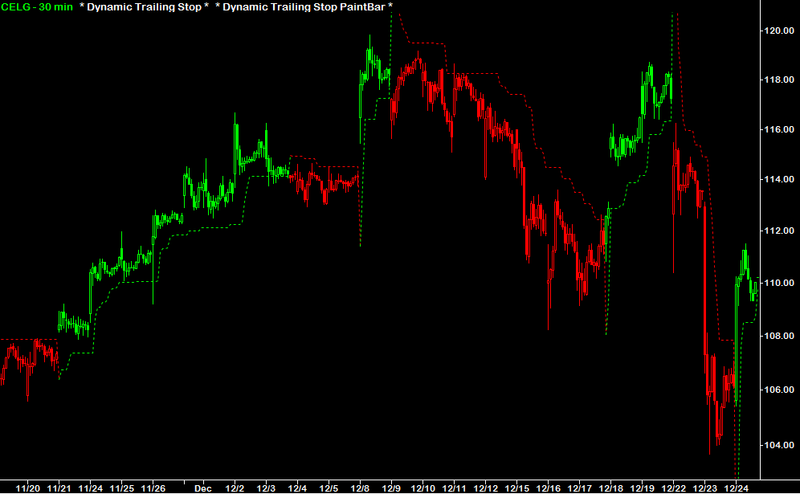 The Dynamic Trailing Stop is NOT just another ATR-based stop-loss. It's algorithm fuses together standard deviations of range and recent price movements — enabling the DTS to adapt to intelligently adapt to price movements. When price consolidates or moves sideways, our proprietary “Smart-Stop” technology pinpoints recent support and resistance levels — remaining unchanged until price exits consolidation and resumes moving upwards or downwards. Another benefit is the ability to “Round to the Nearest Tick(s)”, which lets you adapt the DTS to each unique trading instrument and specific tick sizes (minimum price movements). The DTS intelligently adapts to price movement — remaining accurate and effective across all timeframes, chart types, and trading vehicles (stocks, options, ETFs, fixed income, futures, FX, commodities, and cryptocurrencies). The DTS PaintBar is a visual aid that simplifies chart analysis by color-coding each bar based on whether price is above or below the DTS. Not only does the DTS serve as a highly effective stop-loss, but it can also be used to determine if the current trend is bullish or bearish. Do you know where to set your stop-loss? The DTS does. The DTS Indicator Package also includes a special "Scanner" Indicator designed to scan for signals and trend conditions using the NinjaTrader Market Analyzer, TradeStation RadarScreen, or MultiCharts Market Scanner. And all columns, colors, and text are fully customizable! As you can see in the screenshots below, using the DTS with the NinjaTrader Market Analyzer, TradeStation RadarScreen, or MultiCharts Market Scanner allows you to scan for crossover signals and trend conditions across any list of symbols — in just seconds! 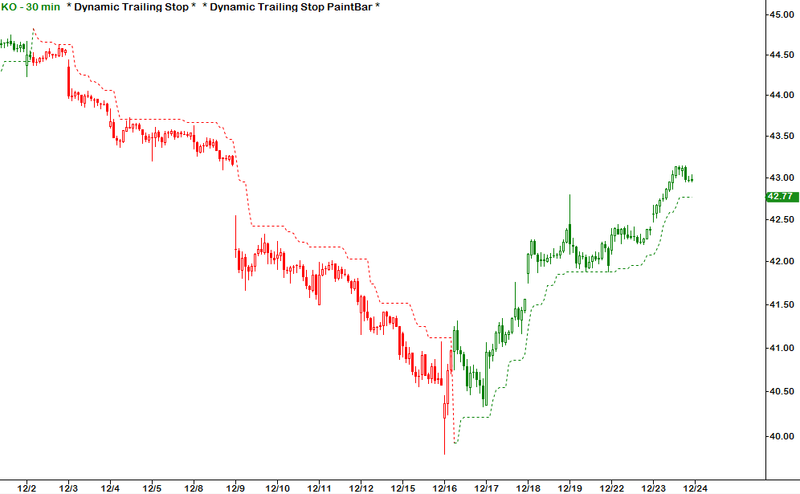 Have a question about the Dynamic Trailing Stop Indicator Package? Check out the Dynamic Trailing Stop User Guide to learn more! 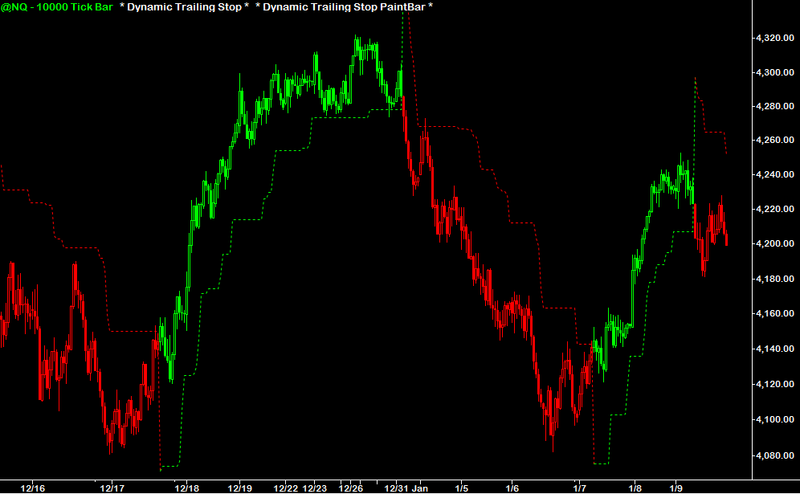 It’s a relief to finally have an effective stoploss level in place without guessing where to put it. 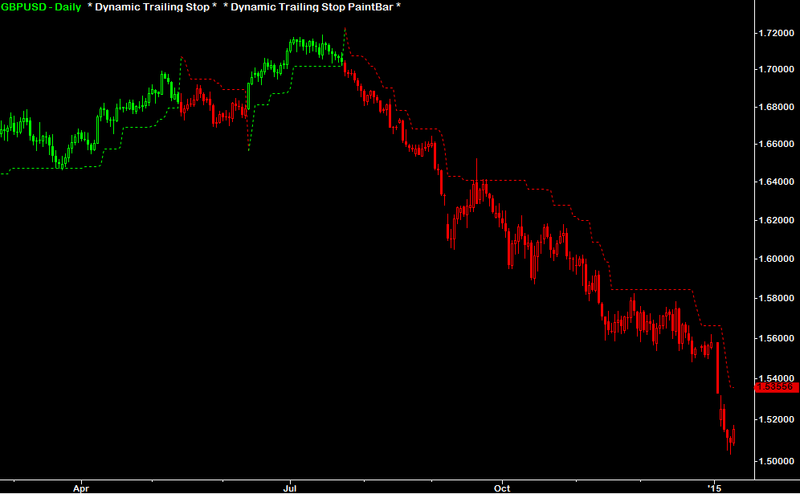 The DTS has allowed my winners to run and I still have a perfect stoploss in place. Combining the DTS and PaintBar has made it much easier for me to figure out whether the trend is up or down. No more trend confusion and no more guessing! Thanks again for helping me implement the DTS into my automated strategy, guys. It’s letting my winning positions run and I’m not taking profits too early anymore…this is exactly what was missing for me! The DTS is king when it comes to exits! I’ve been following your tip to use 3 DTS on different settings and closing out 1/3 of the position if price hits the level. Working perfectly and helping me keep my sanity, which is worth 100x the price. I've done away with the moving average crossovers, Parabolic SARs, and all the other ineffective stuff that works one day and not the next. It seems simple but I know it can’t be because it’s so effective. 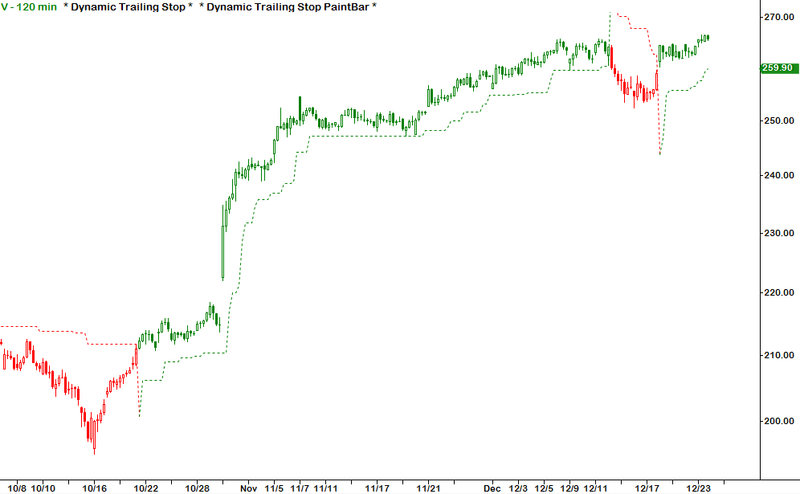 I’ve always used trailing stops to manage my exits and the DTS has the edge over others. I really like how it stays at the same level when price moves sideways instead of constantly updating after each bar for no reason. What is the most valuable feature of the DTS Indicators? The DTS utilizes “Smart-Stop” technology, which allows it to remain at the same price level for several bars until there is an increase in vertical price movement. This ability to be both dynamic and fixed allows it to outperform all other stop-loss indicators and methods that we have tried and tested. 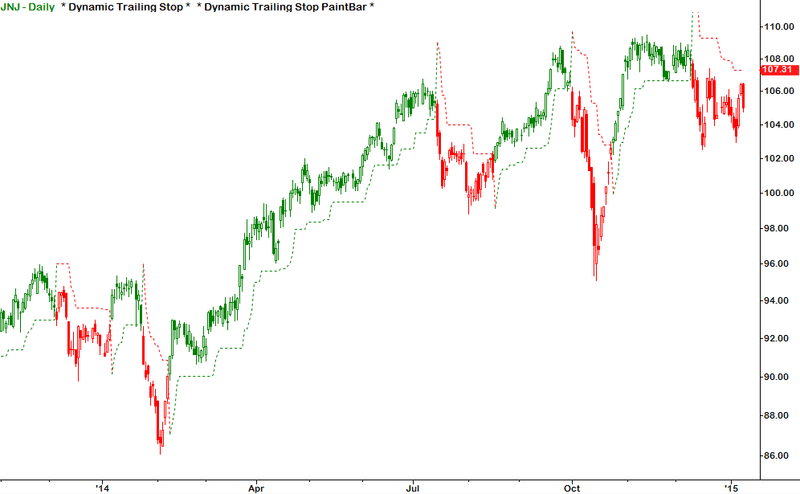 Using the Parabolic SAR or ATR-based stop-loss methods proved to result in smaller winners and more frequent stop-outs when compared against the DTS. The DTS Indicators are effective across all timeframes and chart types, so the "best" will be whatever is most compatible with your specific trading style. Keep in mind that price data and liquidity almost always improve as the timeframe increases (a 1-minute chart will often exhibit more random price movements than a 60-minute chart). - The DTS Indicators include optional alerts for when price crosses above or below the DTS line. The DTS Indicator Package includes a specialized scanner Indicator that is designed to be used with the Market Analyzer (NinjaTrader), RadarScreen (TradeStation), or Market Scanner (MultiCharts). You'll also receive fully configured templates and workspaces so that you can begin scanning for signals and trend conditions immediately! How can I use the DTS Indicators within my own automated strategies and codes? The DTS Indicators can be used in your own custom strategies and Indicators by purchasing the DTS User Functions”, which are sold separately for $95. 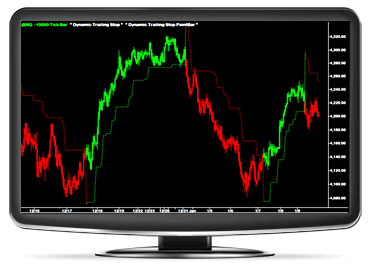 * You must own the DTS Indicator Package to use the Functions since they reference the Indicators. What other Indicators do you recommend using in combination with the DTS? The DTS is a versatile took in that it can be used as a stop-loss to manage your positions, it can assist with entries, and it can be used as a very effective trend filter (bullish or bearish). 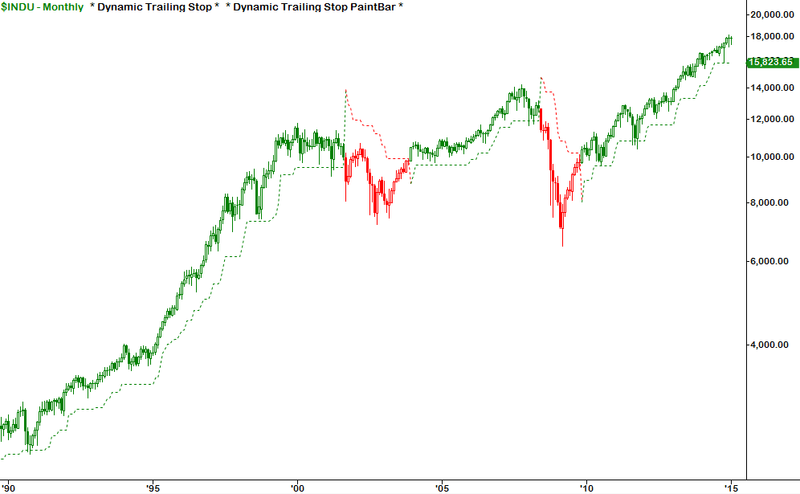 Pairing the DTS with any other Indicator can increase the effectiveness by keeping you on the right side of the trend. The DTS MTF Indicator (Multiple-Time-Frame) is a powerful add-on that will allow you to monitor the DTS trend conditions and signals on up to 5 different timeframes at once! 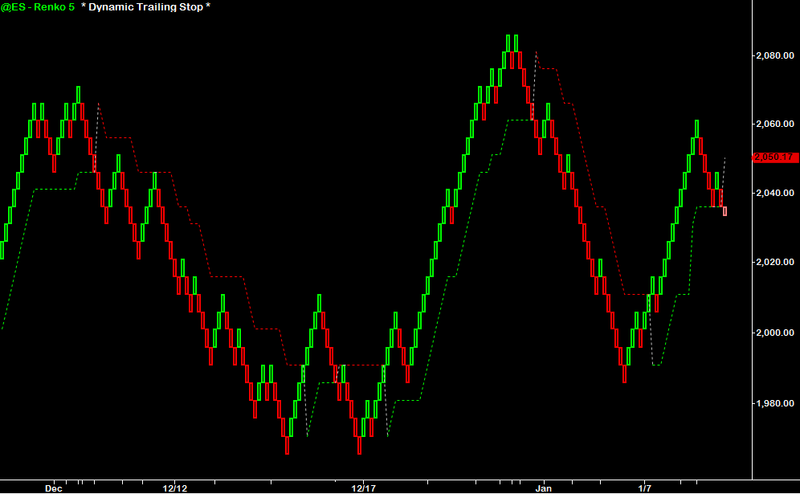 Click here to see the DTS MTF Indicator in action! DTS Length: Determines how many bars to use when calculating the DTS. Stop Proximity: Controls how the algorithm calculates each price movement, which determines how tight or loose the stop-loss is when trailing price. Rounding Enabled: Set to “True” to round the DTS stop-loss value to the nearest tick(s). Set to “False” to use the raw DTS stop-loss value.